New Release - Our American Roots | Get it on The Delos Store | Delos Music | Outstanding Classical Recordings for over 40 Years! The foregoing is typical of the effusive critical response to Emmanuel Feldman’s marvelous cello artistry, wherever he unleashes it. 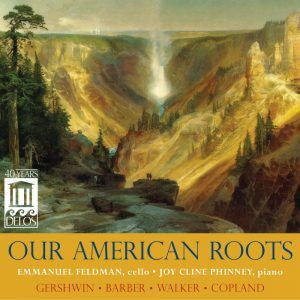 In Our American Roots – his first recording for Delos – Feldman applies his prodigious talent and skill to an all-American program of music for cello and piano – to include a pair of rarely heard (and recorded) cello sonatas by Samuel Barber and George Walker. The remainder of the program consists of winning arrangements of beloved musical Americana: arias from George Gershwin’s Porgy and Bess and his Preludes, as well as two movements from Aaron Copland’s ballet score Billy the Kid. Feldman, a Curtis graduate, went on to study at the Paris Conservatoire Supérieur on scholarship before embarking on a singularly successful career encompassing solo recitals, chamber performances and concerto appearances with leading orchestras. He also teaches with distinction at Tufts University, Brown University and the New England Conservatory. Emmanuel, with the inspired and vibrant collaboration of piano sorceress Joy Cline Phinney, delivers his program with silky-smooth, yet robust tone and vivid musical colors, while alternating between spunky spirit and supremely soulful interpretive depth. Buy from Delos and Get FREE Shipping!